NMAF: Can you explain the process of choosing the child on the cover? Christine Dewairy: Well, it had to be a mixed-race child, obviously. * But we also wanted to go in extremely close, and this little girl had such gorgeous skin, captivating eyes and lush curly hair. She was perfect. Also being about three years old, she was still in that very pure, sweet, innocent age. 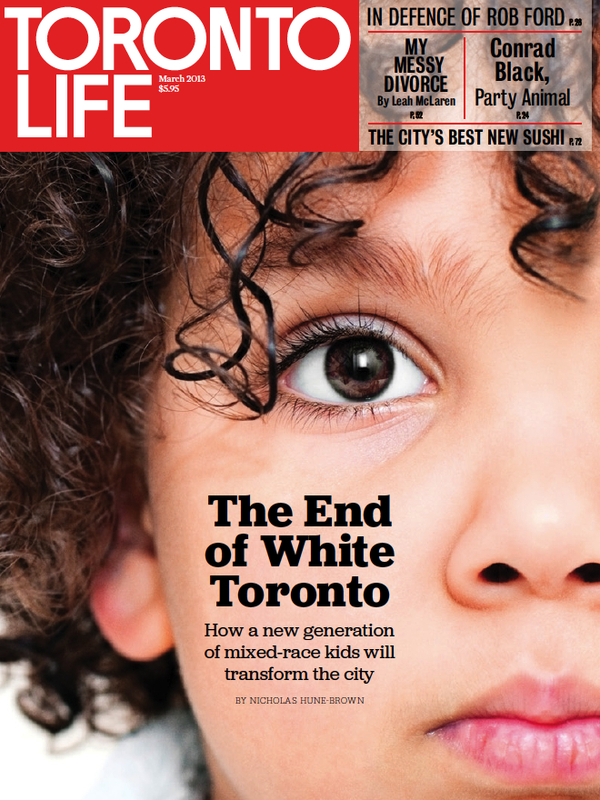 *Editor’s Note: The cover story of this issue of Toronto Life, “Mixie Me” by Nicholas Hune-Brown, is also nominated for 2 NMAs this year. NMAF: Did you always know that the image would only show a portion of the child’s face? Christine: No, but we did know it was a gatefold cover and that we’d need something on the flap. Showing only a portion of her face gave it impact and intimacy that would have been lost had the photo been more pulled back. I wanted the newsstand reader or passerby to be drawn in by the intense eye contact, and then the understated headline directly below. Also, because the story wasn’t about this child in particular, but about a societal shift, by zooming in on the face, it becomes less about the person and more about the features — the eye, the hair, the skin, etc. NMAF: Placing text on someone’s face is unique and unconventional for magazine covers. Did you have any hesitations about this? Christine: I didn’t want to lose the immediacy and impact of the larger-than-life face, to make room for the headline. The type becomes part of the image. You can’t look at one without absorbing the other simultaneously. NMAF: Some might look at this cover and be immediately drawn to the child’s eye. In your opinion, what do you think is the focal point of this cover? Christine: The viewer’s eye might wander at first, from the girl’s eye, to her lashes, her curls, and so on, but I think it’s impossible to just stop at the eye. Her features frame the type in such a way that marries the elements. NMAF: What were some concerns and challenges when putting together this cover? Christine: One question was how small you can go with the main sell, and how low you can place it on the page, and still draw people’s attention. We decided to keep it relatively small. I think sometimes a whisper can be louder than a shout, especially when you lay it on an enormously compelling image, like this one, and the words are super clear and unequivocal.